"Let's try to look at this thing realistically. The Maharani is giving Rama his choice. He can have Ranchipur or you. He can't have both." Decades before Airport, The Poseidon Adventure, and The Towering Inferno captivated audiences with campy tales of distress and destruction, another wave of disaster movies swept through Hollywood. RKO started the craze with The Last Days of Pompeii (1935) (which climaxes with a thrilling recreation of the eruption of Mount Vesuvius), and the box office stampede that greeted that earthshaking epic inspired every studio in town to hop aboard the calamity bandwagon. 20th Century Fox especially embraced the fledgling genre, and turned its premier star, Tyrone Power, into the George Kennedy of his day, tossing him into one catastrophic situation after another. He valiantly battles the 1871 Chicago fire in In Old Chicago, withstands a vicious sandstorm in Suez, and weathers earthquakes, floods, and plague in The Rains Came, an adaptation of Louis Bromfield's runaway bestseller. Unfortunately, the latter film meanders along, taking itself far too seriously while failing to treat the novel's hot-button issues seriously enough. In its literary form, The Rains Came follows a group of British colonists living in the fictional Indian province of Ranchipur in the 1930s, and examines how the clash of cultures, devastating poverty, and prejudicial caste system complicates their existence. The watered down film version, however, only hints at such themes, preferring instead to play up the more mainstream romance-in-the-face-of-disaster angle featuring Power, Myrna Loy, and George Brent. In olive-toned makeup and stylish turban (but without an ethnic accent), Power portrays noble Indian physician Rama Safti, whose mystical charms melt the icy reserve of Lady Edwina Esketh (Loy), the spoiled, adulterous wife of a stuffy diplomat (Nigel Bruce). Old flame Tom Ransome (Brent), a dashing ne'er-do-well, muddies the waters, but it's feisty Mother Nature who really turns Ranchipur upside down, changing the face of its landscape and the attitudes of its residents with a devastating one-two punch. 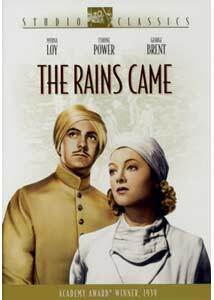 An affair between a British lady and Indian doctor in the late 1930s would almost certainly incite scandal, but The Rains Came steers clear of such messiness, and ignores the liaison's potent dramatic possibilities as well. As a result, the script by Philip Dunne and Julien Josephson remains cold, pompous (even during emotional scenes), and devoid of any social conscience. The film's first 45 minutes are an exercise in tedium, but the earthquake and flood perk up the proceedings, thanks to Oscar-winning special effects that still hold up well today. (Surprisingly, The Rains Came beat both Gone With the Wind and The Wizard of Oz in that category.) Known for his visual artistry, director Clarence Brown (who helmed many of Garbo's best films) crafts several striking sequences, often beautifully manipulating and exploiting the omnipresent rain. Coupled with glamorous close-ups of Power and Loy, and impeccable production values, The Rains Came certainly fills the eye, but never stimulates the mind. Power keeps reminding us he's Indian, because little else in his portrayal gives us a clue, but his dark good looks and earnest line readings somehow put his character across. Although it's refreshing to see Loy cut loose from the Nora Charles housewife mold, she's stiflingly stiff here, and her robotic performance further alienates us from the film. (Fox studio chief Darryl F. Zanuck reportedly took issue with her interpretation of Lady Esketh, and I can see why. Sadly, Loy ignored his criticisms.) The underrated Brent, however, contributes some of his best work as the morally suspect, cognac-swilling Tom, and easily walks away with the acting honors. On the plus side, The Rains Came boasts a dazzling array of supporting players, and fans of the great Golden Age character actors will enjoy spotting such stalwarts as Nigel Bruce (best known as Dr. Watson in the Basil Rathbone Sherlock Holmes films), Maria Ouspenskaya (The Wolf Man), Joseph Schildkraut (The Diary of Anne Frank), Mary Nash, Jane Darwell (who would win an Oscar the following year for her heartbreaking portrayal of Ma Joad in The Grapes of Wrath), Henry Travers (the angel Clarence in It's a Wonderful Life), H.B. Warner (The King of Kings), and Laura Hope Crews (Aunt Pittypat in Gone With the Wind). Though even these seasoned pros can't rescue the film, their fine work makes it well worth watching. 1939 produced some of the best movies of all time, and many critics cite The Rains Came as one of the year's most prestigious and meticulously crafted productions. To a point, they are correct. The sets, costumes, and special effects are all top-notch, but they can't overcome the film's more glaring deficiencies. In my book, though, the plodding story, lack of meaty themes, and lukewarm performances of Power and Loy make this tale of monsoons and floods a washout. Image Transfer Review: For the most part, the full-frame transfer delivers a clear image, solid contrast, and good shadow detail, but a couple of instances of severe shaking rival the film's earthquake sequence, while reminding us of the print's age. Blacks, however, are rich and deep, and a varied gray scale punches up details. While grain afflicts some sections more than others, it never distracts, and only mild speckling dots the print. The omnipresent rain is artistically presented (and well rendered), and the special effects seamlessly blend into the body of the film. Audio Transfer Review: Both stereo and mono tracks are provided, and though most of the age-related surface defects have been removed, an annoying tinny quality remains. The music over the main titles sounds downright shrill, and some of the dialogue possesses a sharp edge. Robust audio, however, distinguishes the disaster and storm sequences, with a healthy sprinkling of bass adding atmosphere to the visuals. Extras Review: Only a couple of supplements adorn the disc, and by far the most interesting is the audio commentary with film historians Anthony Slide and Robert Birchard. Both men pack the track with an array of anecdotes, trivia, and insightful observations that make the time fly by. They discuss the differences between an early version of the script and the final draft, as well as alternate casting choices (such as Marlene Dietrich and Charles Boyer) for many of the principal roles. We learn a Fox production executive didn't want a story about India, but a film concerning a group of people in India, which explains the movie's generic foreign feel. The pair also provides background on author Louis Bromfield (who wrote the original novel and, in a bit of unrelated trivia, served as best man for Humphrey Bogart at his wedding to Lauren Bacall), and many of the actors, as well as an analysis of the impressive special effects. In addition, they note how, in their opinion, Fox films seem to hold up better than the more highly regarded product of the studio's fiercest competitor, MGM. Both scholars enjoy a nice rapport, and present their information in a down-to-earth, engaging manner. Not much else is here, except a still gallery, which features only 11 images, and combines a selection of color poster art with black-and-white publicity portraits of the actors. A rather choppy theatrical trailer completes the extras package. Although it aspires to be more substantive, The Rains Came rarely rises above a stereotypical disaster film. Turgid drama stymies this white-washed tale of India, and not even potent star power and impressive special effects can rescue it. Fox supplies a good transfer, but the flimsy extras make this a rather weak entry in the Studio Classics series.